The Rams looked very impressive in the Kutztown Classic. 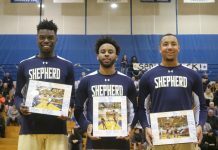 Head Coach Alexander Hoekstra believes the team really has formed an aggressive defensive mentality (Photo courtesy of Shepherd University Athletic Department). The Rams (9-2) took three of four matches in the Kutztown Classic on Friday and Saturday. In the first match on Friday, the Rams took down the Lightning (2-5) Goldey-Beacom by a 3-0 match score (25-20, 25-20, 25-11). Later in the day, the Rams endured their only loss of the weekend, falling to the Golden Bears (4-6) of Kutztown in five games (21-25, 16-25, 25-14, 25-17, 9-15). Against Goldey-Beacom, the Rams came out on fire. No matter where the Lightning tried to place the ball, the Rams were there to record a dig when they needed to, as the team finished with 46 digs in the match. Shepherd’s size and length proved to be an issue for the Lightning to tangle with as well. Freshman middle hitter set the tone for the Rams with her team and game-leading eight blocks. 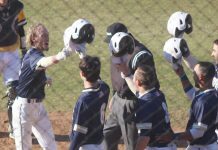 In the third game, the Rams were up 8-7, but put the game away with an 11-0 run that augmented their lead to 19-8, putting the game out of the reach of the Lightning. A kill by sophomore middle hitter Seone Goode (who had three in the match) of the Rams sealed a quick and relatively easy match victory for the Rams. Freshman outside hitter Breanne Haley did her best to keep the Lightning in the contest with her team-leading 12 digs and 9 kills, but it was not enough to stop the Rams’ attack. Later on Friday, the Rams had a much tougher test against the Golden Bears of Kutztown. The Rams took the first two games, but then ran into a brick wall, mainly built by themselves. 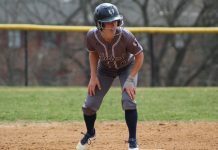 In game three, the Rams fell, thanks largely to eight attack errors by the Rams led to a quick 14-4 lead for Golden Bears, as the Rams’ mistakes began to pile up. Freshman Alli Henderson took it to the Rams in game four, as she had four of her 18 kills in the match during a crucial run that put the Golden Bears up 14-9. The momentum was clearly on the Golden Bears’ side, as they would go on to win the fourth game 25-17. In the fifth game, the Rams did not appear up to the challenge, as the Golden Bears closed out the match with a 15-9 victory that was finished off by a kill by freshman Holly Owen of the Golden Bears, who had five in the match. Sophomore outside hitter Cambriea Hill led the Rams’ attack with 15 kills. On Saturday, the Rams prevailed with a 3-2 match victory in both contests against the Golden Rams (9-1) of West Chester Unviersity (23-25, 25-16, 18-25, 25-18, 15-11) and the Cougars (5-2) of Caldwell University (20-25, 25-27, 25-21, 25-23, 15-11). In this five-game classic, both teams fought very hard, particularly to keep the ball alive. The Golden Rams recorded 78 digs, while the Rams posted 76 of their own. There was not much to split between these two teams in the effort department. The Rams had 2-1 edge in the match, but the Golden Rams did not come into this game undefeated for no reason, as they mounted a clutch game four performance. A service ace by defensive specialist Alex Gleason, who had two in the match, gave the Golden Rams a 24-18 lead. 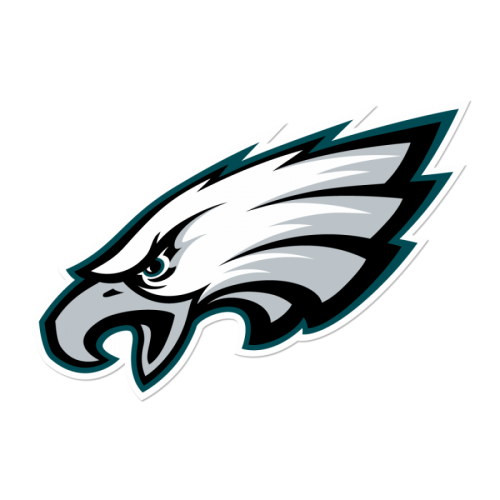 Hill would commit an attack error that would give the Golden Rams a 25-18 victory and send the game into the fifth and final game. However, the Rams would bounce back and take the fifth game and the match with by a 15-11 score. Sophomore setter Jessica Karcz (35 assists, 3 aces) was the biggest reason why. She posted the final two points with a service ace and by recording a kill. In the team’s first loss of the season, the Golden Rams’ junior setter Jillian Grammer certainly did not go down without a fight, as she finished with an astonishing 52 assists. In the final match of the tournament, the Rams prevailed in a 3-2 fashion against the Cougars of Caldwell University. Early on, the Rams were getting it handed to them, as they dropped the first two games. Various attack and service errors were to blame in game one for the Rams. In game two, the Rams again could not stop themselves from committing numerous attack and service errors, as seven of the last eight Cougar points came as a result of self-inflicted wounds by the Rams. However, in the final three games, the Rams would settle down and get back to how well they were playing the whole tournament. Senior middle hitter Christine Jackson (6 blocks, 2 aces, 9 kills) and senior outside hitter Amanda Snowden (13 kills) really displayed great leadership in game three, as they posted numerous kills to get the Rams back on the right track with a 25-21 win. In game four, with the match in the balance, Hill was set up nicely by Karcz, who closed out the game with a kill. 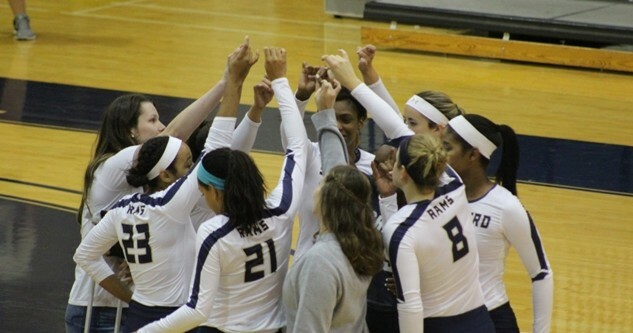 The Rams won the fourth game 25-23, and would take that momentum into game five. The Rams were able to continue their strong play in game five, as fatigue became a factor. The Cougars committed five crucial attack errors that all but sealed their fate. Karcz found Snowden to close out the match with an emphatic kill that preserved a 15-11 match victory, ending a successful tournament run for the Rams. Senior libero/defensive specialist Jessica Mitchell (25 digs) and junior setter Jordan Hoffman (43 assists) of the Cougars put up a valiant effort, but the Cougars could not sustain the strong play they put on display earlier on. After the tournament concluded, Coach Alexander Hoekstra of the Rams stated through text messages that he was very proud of his team’s performance in the tournament. When asked where he has seen the greatest growth in the team this season, Hoekstra said that the team has found their true identity, even with a younger lineup. The Rams will be aiming to continue their strong play here lately when they host Wheeling Jesuit at 6:00 p.m. on Friday, Sept. 22.